A woman is cut into three and left in boxes in a train station. It's a gruesome murder, and you might think it's quite shocking, but in this book it seems to have very little impact. 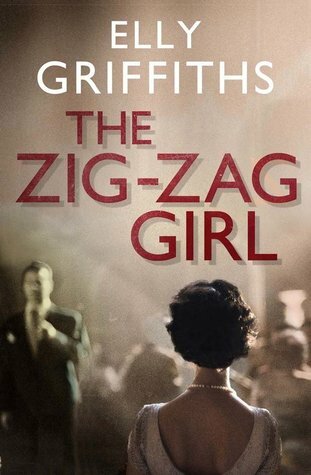 The Zig Zag Girl is set in 1950's Brighton, and while not quite a 'cosy' murder mystery it certainly comes close. The sense of danger or fear is never there, not in the first scenes of the murder, not when the detective has to look at the dead body, and not even near the end when he is coming close to catching the villain. Edgar Stephens, the detective investigating the crime, doesn't have much impact either. The magicians and showgirls around him don't achieve much sparkle for it's quite a glum book, but they at least have a sense of life. Ed doesn't have a distinct personality beyond moping over his lost love, and his investigations are ineffectual. Another big flaw for me is that I didn't feel the 1950's atmosphere was captured, it could easily have been set in the present day. What it does well is to show us the life of a performing magician in the 1950's. The sequins and showgirls and the magic tricks on stage mixed with the grime of backstage were interesting enough on their own to keep me involved to the end. Overall though it didn't live up to the promise of a thrilling read and it left me underwhelmed. Sign into Goodreads to see if any of your friends have read The Zig Zag Girl.